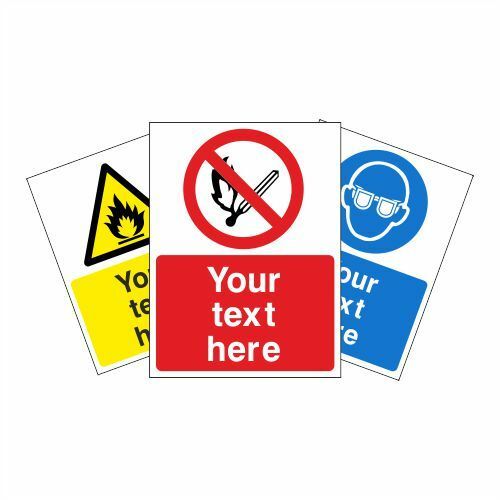 Our huge range of Safety Signs are designed to meet local and government regulations and we supply sign products to schools, construction, & building, warehouse, office and workplace environments. Selling to both Trade and public, we manufacturer our Signs in-house and offer a 5 year warranty against cracking and fading and a money back guarantee on our products. Almost all our signs are available with bulk pricing and are kept in-stock for prompt delivery via Royal Mail or DPD Courier. We can also create customised signs with a short turnaround. Our signs are available in a range of materials, including self adhesive vinyl, rigid plastics, glow in the dark, fluted boards, and aluminum and a huge range of sign sizes. Our Fire Exit Signs are designed to help you navigate during an emergency evacuation and Fire Safety Signs will inform you of assembly points and provide clear safety information in the event of a fire. Our Construction Sign range is designed specifically to warn of on-site dangers within the UK building and construction industry. First Aid Signs are fully compliant with BS EN ISO 7010 and are designed to protect employees, visitors and general public. Door Signs provide visual guidance for toilets and other information, including Fire Door Signs. And we manufacture many other Signs, please use the categories below or our search box above to locate the sign you require.